The internet has changed people’s lives in numerous ways. From the way we look for information to the way we buy things. Nothing can stop the fast development of this immersion into the new technologies that we have now reached the point where we can no longer even imagine our lives without the internet. In such a reality, people are trying to adapt their lives and to get the best out of it. They want to improve their lives and become more efficient. Why would they go to the restaurant for dinner if they can order food in? Why would they spend time shopping when they can order everything they need in less than ten minutes? There is a constant trend to use the internet, not only to find out information but to get things done. On the one hand, we have buyers, people who try to make their lives easier and better by buying online. Regardless if we talk about making a grocery shopping quick and easy, or ordering an item from abroad. The internet enables fulfilling those needs and the ability to obtain something you could not even imagine two decades ago. Besides convenience, online shopping also provides a great selection of products and services, as well as competitive prices. This is something that provides an incredible advantage over any local retail. Due to the growing expansion of the internet and the fact that new generations are growing up with the internet experience being part of their lives from the early days, the number of digital buyers is constantly on the rise. 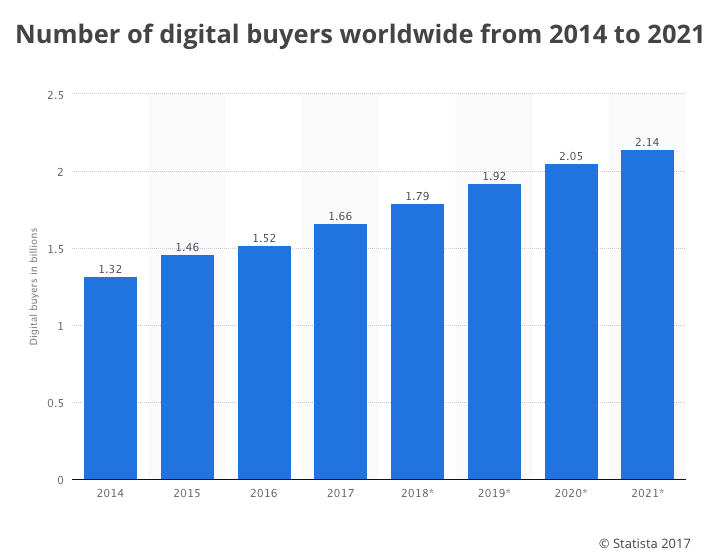 From 1.32 billion digital buyers in 2014, this number is expected to grow to more than 2 billion by 2020. On the other hand, we have people who create or simply resell the products through the usage of the internet. These sellers are turning to the internet as a tool to run their business and ultimately earn their living. Some are choosing the existing platforms specialized in the sale of goods, such as eBay, while others decide to create their online stores. Either way, the goal is to reach consumers and encourage them to buy. As a seller, your goal is first to reach the digital buyers,and then persuade them to buy from you, using a series of promotional activities, online interaction, etc. Buyers and sellers together make up e-commerce, short for electronic commerce. E-commerce is the transaction between a buyer and a seller, which is done through online technologies. It is the process of using the internet to buy or sell online. Despite the fact that e-commerce is something available to anyone and in spite of how easy it might be to start selling products and services online, there are many struggles to make this business viable and actually capitalize your efforts in the digital world. As the market gets saturated, day by day, it becomes even more difficult to place your products on that market. A modern consumer is overwhelmed with numerous advertising messages each day. He is also mobile, which means easy access to the information and ability to buy on the go. A modern consumer is also doubtful and equivocal. Faced with plenty of choices and alternatives, a modern consumer needs to make decisions on a daily basis. All of this shapes the approach of modern businesses whose goal is to reach that modern consumer and persuade him that theirs is the product they should buy. It is not an easy task, but with the right strategy and tools, you should be able to introduce and position your company on the e-commerce market. Getting started with e-commerce is a process that requires learning about different aspects that influence setting up and running an e-commerce website. It is also helpful to have in mind the e-commerce statistics that provide a glimpse into the importance of this industry and the trends that are tremendously shaping the way strategy is implemented.